For 10 glorious games, the nightcap on Aug. 30 until Sept. 8, the St. Louis Cardinals lived up to everyone’s expectations. They went 9-1, compiling two wins via shutout (including a tense 1-0 victory against the Pirates to sweep the series), one win by 11 runs, another by 8 runs and came back from a 5-0 deficit to victory. The one loss, to the Brewers, ended Milwaukee’s nine-game losing streak — something that was bound to stop at some point. Best of all, and thanks to that Brewers streak, the Cardinals saw themselves rise from one game back in second place in the NL Central to a 4 1/2 game lead. Magic number countdowns began — 19 on down to 14. Finally! What we’d waited for through all the Mathenaging of 2014 was at last here! Now there’s today, Sept. 12. Magic number stuck at 14 since Tuesday. Three straight losses for the first time since that great streak of 10 games began on the evening of Aug. 30 — plus three straight losses to the Reds, who hadn’t won three in a row since early August. The Mathenaging of Mark Ellis as a pinch-hitter against Aroldis Chapman in those three losses, two of which Ellis ended by (surprise!) 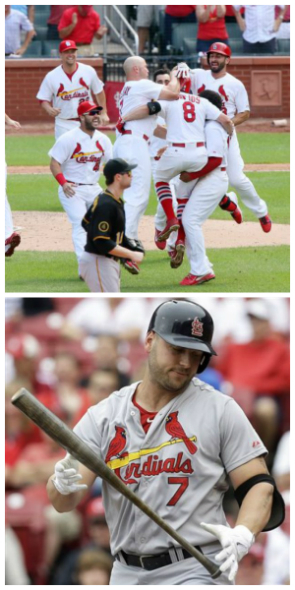 striking out, including yesterday in a 1-0 game after Matt Holliday walked. Division lead now 2 1/2 games since the Pirates, after that sweep by the Cardinals, swept the Cubs and took three of four from the Phillies. Just another bump in the pothole-filled road that is the 2014 Cardinals season? Especially when you take a closer look at what little of the season remains. With the Cardinals done playing the Pirates for the season, making up those 2 1/2 games won’t be easy — meaning the Cardinals’ lead is relatively safe. St. Louis has 15 games left and is 80-67, while Pittsburgh has 16 games and is 77-69. If the Cardinals go just 8-7 the rest of the way to finish the regular season 88-74, the Pirates would have to go 12-4 to finish 89-73. The playoff odds at Fangraphs are definitely in the Cards favor, as they have a 77.9 percent chance to win the Central compared to 18 percent for the Pirates. The Cardinals opponents for the remainder of September include the Rockies starting tonight, followed by the Brewers and Reds at Busch Stadium, then a road trip to play the Cubs and Diamondbacks. The Pirates start a homestand tonight facing the Cubs, Red Sox and Brewers before hitting the road to play four against the Braves and three against the Reds. As the Cards series against the Reds just showed us, however, looking at the records of each team and recent streaks and which team “should” win don’t mean much — which is why they play the games, obviously. But even winning only eight games in two-plus weeks will be enough for the Cardinals to celebrate a second consecutive division title. Shockingly, we as fans might be overreacting as we deal with yet another frustrating stretch from this team — though justifiably frustrated, yet again. We’ve watched what these Cardinals can do, we’ve enjoyed when they’ve played to those expectations, we despise when they don’t. Yet the reality is the odds definitely are on the Cardinals side … even if they haven’t necessarily played like it these last three games. This entry was posted in 2014 Cardinals and tagged Magic numbers, Mathenaging, Odds, Pittsburgh Pirates, playoffs by Christine Coleman. Bookmark the permalink.